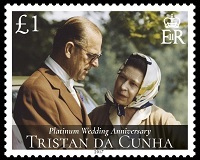 Stamps commemorating the 70th Wedding Anniversary of Queen Elizabeth II and the Duke of Edinburgh. 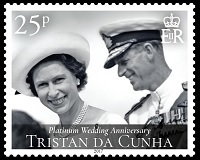 As the royal couple prepare to mark this latest milestone Tristan da Cunha together with Ascension Island, The Bahamas, the British Antarctic Territory, the British Virgin Islands, the Falkland Islands and South Georgia & the South Sandwich Islands look back at their relationship and long and happy marriage. 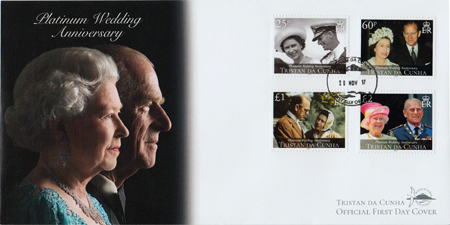 FDC - The Queen and The Duke of Edinburgh at Buckingham Palace on 26th November 2001. 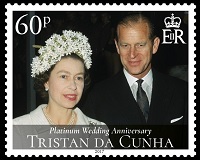 Part of a series of photographs taken to commemorate the Golden Jubilee in 2002. 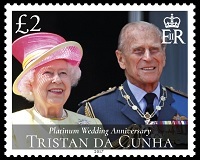 (Photo by Lichfield/Getty Images).